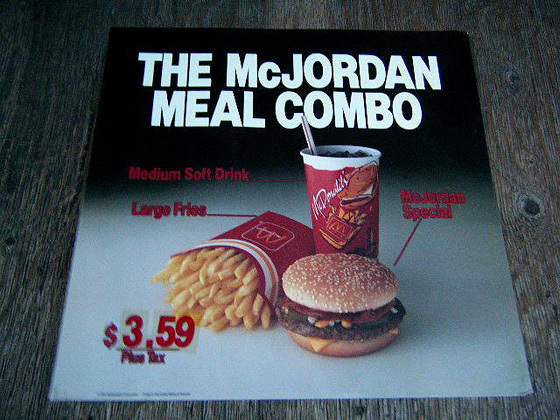 Remember the McJordan Special from McDonald's? It was a quarter-pounder with bacon, American cheese, onions, pickles and special "McJordan BBQ" sauce. 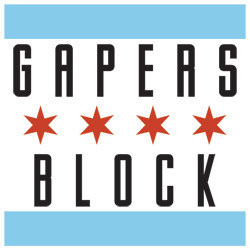 It was sold in 1992 in Chicagoland as well as a few other markets. It was also known as the Big 33, for Larry Bird, presumably in Boston and Indianapolis. You could have what's most likely the last gallon of McJordan barbecue sauce as your very own, if you can come up with $9,995: a bottle is now available on eBay. A once in a lifetime chance to own the rarest of rare Michael Jordan and McDonald's collectible! The only one left on Earth?? 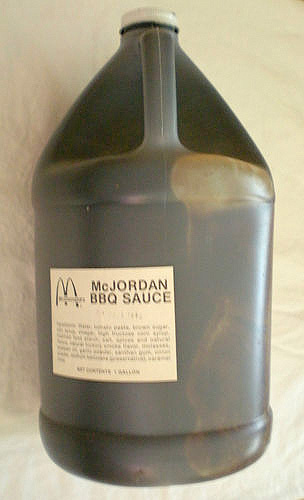 This gallon of McJordan BBQ sauce is from 1992 when McDonald's sold McJordan Burgers as a promotional menu item. The McJordan is a quarter-pound hamburger with smoked bacon, cheese, McJordan barbeque sauce, onions, mustard and pickles. All of Michael Jordan's "favorite ingredients". The burger was sold only in limited markets in the United States. Michael Jordan was the first person to have a McDonald's sandwich as a namesake. 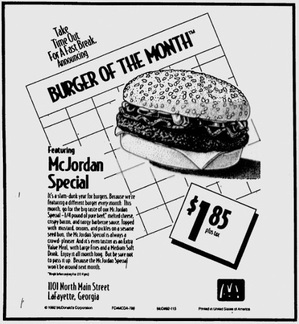 Jordan appeared in television spots to promote the burger. It is in new condition and has never been opened. 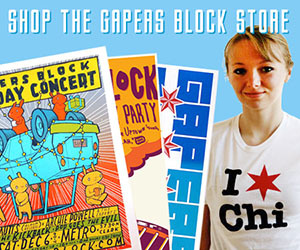 Don't miss this opportunity to own this incredibly rare piece of memorabilia! As of this writing, there have been 30 offers, though all but two have been declined. Considering the legendary shelf life of other McDonald's products -- and considering seven of its 18 ingredients are preservatives of some kind (mostly sugars) -- it wouldn't surprise me if the sauce is perfectly edible. That said, I don't think I'd test that theory. Besides, as Yahoo's Ball Don't Lie points out, you can get the exact same recipe barbecue sauce fresh with your order of Chicken McNuggets today, albeit in a somewhat smaller serving. UPDATE: The sauce sold last night; the buyer was not disclosed.